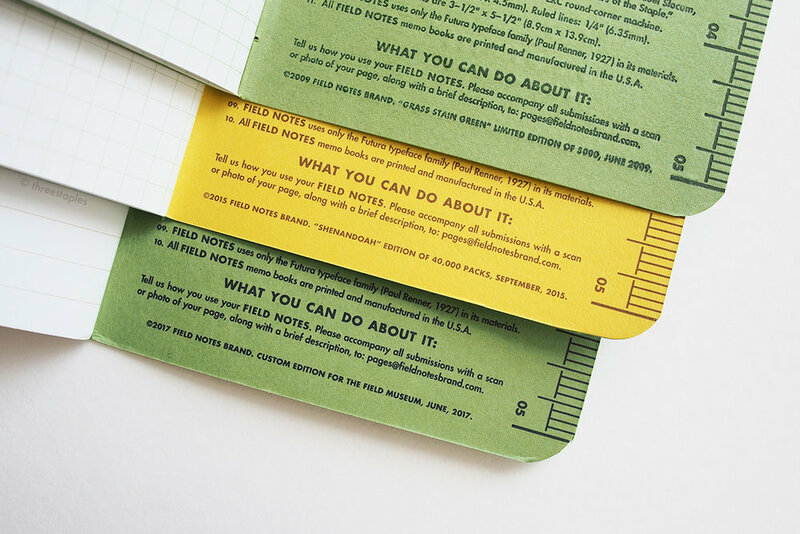 The 2018 Summer Quarterly Edition of Field Notes is right around the corner! I can feel it! I received the “A Note to Subscribers” email couple weeks ago, and most of the summer editions were announced some time in June so far (although Day Game was announced in August, I think). So maybe in the next couple weeks? I say, a good excuse as any to look back at all the Summer editions released so far. What a group, huh. With standouts like Night Sky and Grass Stain Stain, whose praises I've sung many times before, you'd think I’d pick summer as my favorite over any other Field Notes season. But summer also includes some of my least favorites, like Arts & Sciences, Byline, and Workshop Companion. It’s the non-standard format that I don’t particularly enjoy, and 2 out of 3 such editions were both summer releases (A&S and Byline, with Dime Novel being a Fall edition). 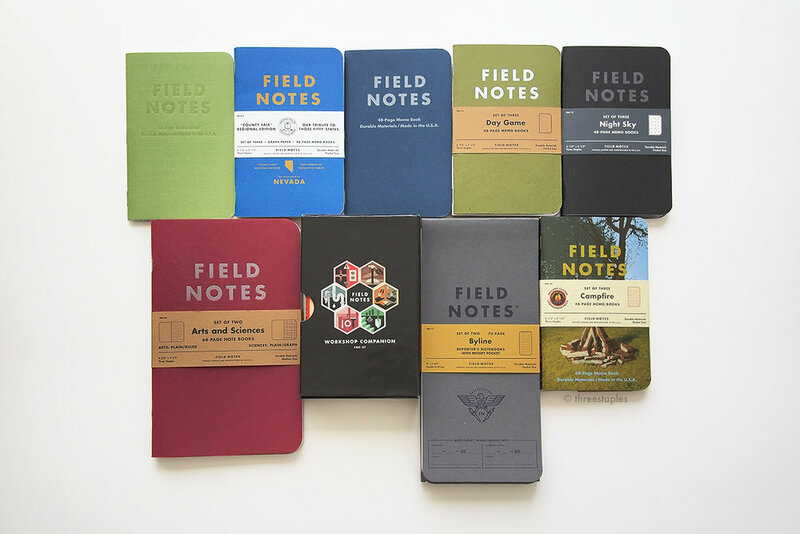 Clearly, plenty of people disagree with me because Field Notes thought it was worthwhile to make Front Page, a spinoff of Byline, and Pitch Black in the A&S size, as part of their regular, non-limited lineup. 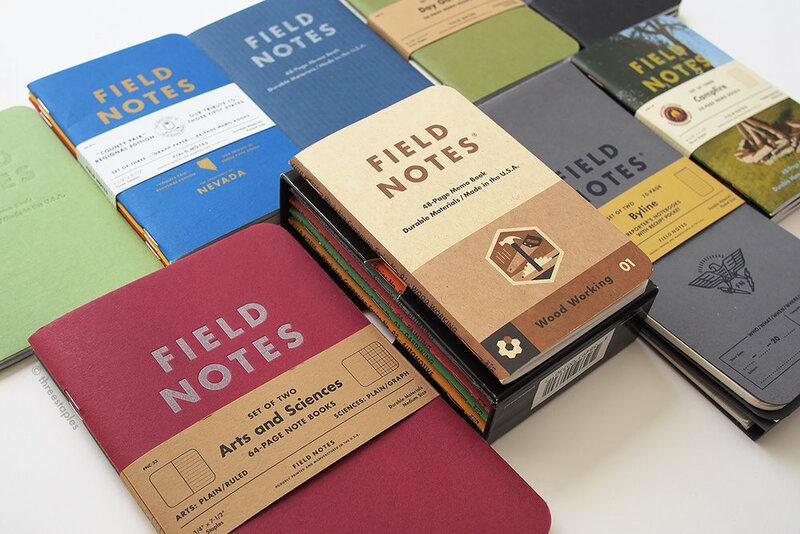 Speaking of spinoffs, Summer also inspired the most number of additions to the regular Field Notes lineup. Besides the already-mentioned A&S and Byline, Night Sky led to Pitch Black (1st version), and County Fair led to, well, County Fair, and they were both summer releases. County Fair was the first one! I still chuckle whenever I see “so complicated” next to the edition size for County Fair. What kind of “firsts” is this year’s summer edition going to boast? Not that it has to have any. I just can’t wait. By the way, the teaser image in the “A Note to Subscribers” email was just a straightforward picture of a blue sky with some wisps of cloud and rays of sun. “It’s just a nice summer sky,” they say. Uh huh. I should mention, Workshop Companion is still strangely available at Field Notes website, here. The only summer quarterly edition that hasn’t sold out yet! Maybe because it’s a 6-pack, with higher price tag? At $19.95, it’s actually become a more economical choice since the price increase, heh. Anyway, what are some of your favorites in this group of summer releases? Besides GSG and Night Sky, I really like County Fair and Day Game, too. There may be other Field Notes that use the same paper, but these are all I have. As you can see, I don’t have the original, plain white belly band of Grass Stain Green (I only have a single), but don’t they look lovely all together? I think that these light brown belly bands look especially great with the matte green covers. Obviously, GSG stands out because it’s the only one that’s letterpressed (“blind hit” to be more specific). It’s one of the most beautiful Field Notes and certainly one of my top favorite editions, but so is Shenandoah, with its custom-duplex cover and brown ink that work together to complete the forest theme. The Field Museum edition may seem plain by comparison, but it’s still special to me because of all the memories I have of going on field trips to the museum when I was younger. Back inside covers (from top): Grass Stain Green printed with “Green Mind” ink, Shenandoah “Sweet Birch” with “Shenandoah Salamander” brown ink, The Field Museum with “Lake Michigan Blue” ink. All three editions use “Gumdrop Green” in 100#C for the cover, but Shenandoah feels the thickest because it is duplex-mounted to another sheet of paper, French Paper Pop-Tone in “Lemon Drop”, making it the only one whose cover looks different when you open it. As for the body paper, they all use “white” paper, except GSG uses Boise Offset Smooth 50#T, which is what Field Notes used in the early days. Since Balsam Fir, they have been mostly using Finch Paper Opaque Smooth, which is what you’d find in Shenandoah and The Field Museum edition, both slightly thicker in 60#T. 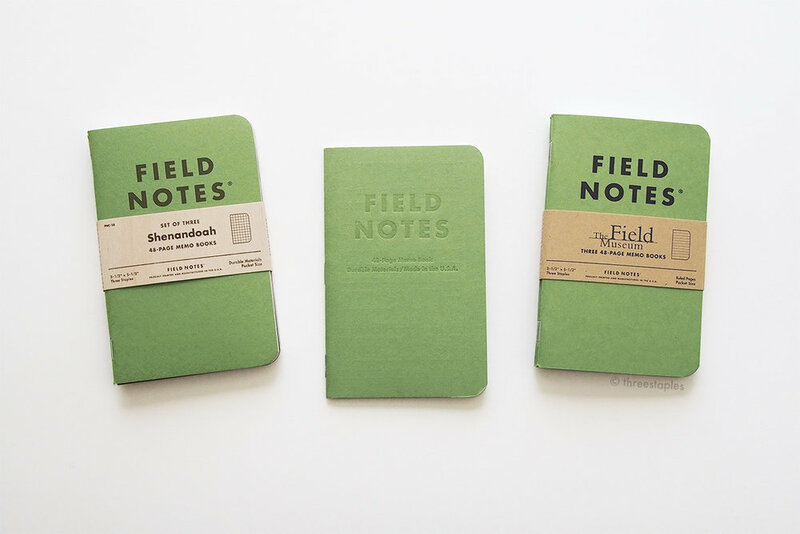 Both GSG and Shenandoah are graph grid (3/16"), printed in “Photosynthesizing Chlorophyll” light green and “Appalachian Moss” light green, respectively, while The Field Museum is ruled (1/4" or 6.4 mm) in “Double Knee Duck Canvas” light brown ink, the same color you’d find in Field Notes’ standard Kraft memo books. Fun (to me) side note: the inside cover of GSG specifies 4.5 mm for the grid size, but the conversion should’ve been 4.7 mm. I believe this doesn’t get corrected until National Crop (Spring 2012). From top: Grass Stain Green, Shenandoah, and The Field Museum. Innards in Grass Stain Green are 50#T, making it the thinnest memo book in this group. Shenandoah feels the thickest with its custom-duplexed cover. Back view, from left: Shenandoah “Birch”, Grass Stain Green, The Field Museum. There’s a second set of The Field Museum Field Notes, with Earth as the theme! It is available online, here. The first version (the green 3-pack featured in this post) is now on sale, here. © 2014–2019 Three Staples. All Rights Reserved. Please DO NOT use any part of this site, especially pictures, without permission. I’m being serious. Please see ABOUT page for details. February 2015 was HUGE for me, you guys. I got some shout outs directly from Jim Coudal and Field Notes. Gimme all of these. Stat. Some Amazon.com links on this site may be affiliate links, which means: if you follow these links and make a purchase, I will receive a small commission. You will not pay more by clicking through these links. Every little bit will help fund the hosting of Three Staples, so your support would be greatly appreciated. Thanks! Copyright © 2014–2019 Three Staples. All Rights Reserved. Please do not use any part of this site without permission.